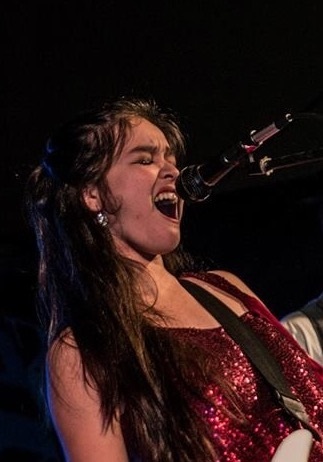 She’s been fronting her own rock band, Elora & Gasoline Alley, since she was 10 and although audience’s first impression of her and her band was the “cuteness factor” of kids performing Classic Rock, after only listening to her sing for a sort time audiences quickly knew that there was something very special there. The local media also took notice. The San Antonio Express-News noted her as an up and coming artist and The San Antonio Current, was quoted “Watching Elora Valdez sing Gun N’ Roses “Paradise City” is humbling beyond calculability…I’m impressed.” Elora has appeared and been featured on many local media programs such KTSA’s Jack Riccardi Show; KENS-TV’s Great Day SA Extraordinary Kid’s; San Antonio Living; WOAI News, FOX News First; FOX San Antonio KABB’s Daytime@ Nine, KSAT 12, KERV Radio Kerrville; KUNO AM Corpus Christi; KSAB FM Corpus Christi; KZTV News Corpus Christi; KRIS News Corpus Christi; KBAY 92.7 Corpus Christi, Texas; and KZFM Hot Z 95 Corpus Christi to name a few. Now 16, Elora is a seasoned musician who is considered one of South Texas’ rising stars in music. With over 350 performances, an EP, an album and a children’s book written about her and her band, she has developed a national and international following with music fans across the United States, Mexico, Canada, England, Spain, Germany, Japan, China, Australia, Serbia and Russia thanks to her social media. In 2012, with release of her debut single: Dance the Night Away from her Rock the Cure EP she became the youngest artists to earn the #1 Ranking on ReverbNation’s Pop and Rock Chart for San Antonio, Texas. In 2013, Elora was nominated Best Singer/Song Writer by the San Antonio Music Awards and a Children’s book was also published titled: Elora and Gasoline Alley: The Making of a Kid’s Band written by Dr. Marcella Villegas-Garcia to promote music and literacy in schools. In 2014, she became the youngest honoree to be included in the Inaugural 2014 Who’s Who in San Antonio Women’s for accomplishments in her music, community services and leadership as a role model to young girls. In 2015, she was named “Artist of the Year by TMV Café Radio . She was also named “Best Female Vocalist” and “Best Vocalist for the San Antonio Music Awards. Most recently she was named as one of the “Top 10 Artists of the Year” for Young Guns Music Magazine coming in at the #1 spot.